Eritrea was awarded to Ethiopia in 1952 as part of a federation. Ethiopia's annexation of Eritrea as a province 10 years later sparked a 30-year struggle for independence that ended in 1991 with Eritrean rebels defeating governmental forces; independence was overwhelmingly approved in a 1993 referendum. A two-and-a-half-year border war with Ethiopia that erupted in 1998 ended under UN auspices in December 2000. Eritrea hosted a UN peacekeeping operation that monitored a 25 km-wide Temporary Security Zone (TSZ) on the border with Ethiopia. Eritrea's denial of fuel to the mission caused the UN to withdraw the mission and terminate its mandate 31 July 2008. An international commission, organized to resolve the border dispute, posted its findings in 2002. However, both parties have been unable to reach agreement on implementing the decision. On 30 November 2007, the Eritrea-Ethiopia Boundary Commission remotely demarcated the border by coordinates and dissolved itself, leaving Ethiopia still occupying several tracts of disputed territory, including the town of Badme. Eritrea accepted the EEBC's "virtual demarcation" decision and called on Ethiopia to remove its troops from the TSZ which it states is Eritrean territory. Ethiopia has not accepted the virtual demarcation decision. Technical specifications of the most frequently encountered Eritrea gold coins. 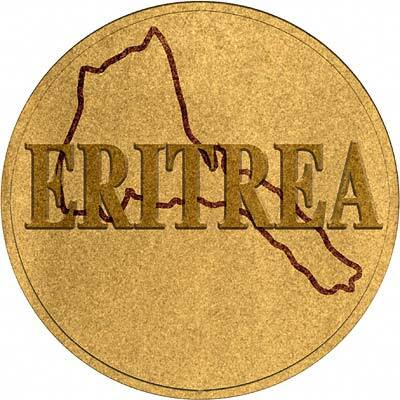 For silver and base metal coins of Eritrea, please look at our original Chard Coins website. We make an active market in almost all world coins, gold or otherwise, including Eritrea gold coins. If you have any of these coins to sell, please contact us, or post them to us for appraisal and offer.